It is the 1950’s, the Cold War is raging and the Red Scare is in full force. Commies are infiltrating every facet of our society while McCarthy is pointing the finger at everyone. Cars are lumpy and growing fins, the Martians are invading and aliens (pick a species) in bad costumes are nabbing pretty actresses from movie sets across the world. The Pod-people are in town, strange and unforgivable spacecraft are falling from the sky, and women aren’t allowed out of the kitchen. In the meantime, George Pal and Roger Corman are cranking out movies faster than you can say “Monster from what?” DDT is being served as a refreshing pick me-up drink and giant planets/asteroids/comets /stars /three headed lava frogs are bearing down on the Earth from space. 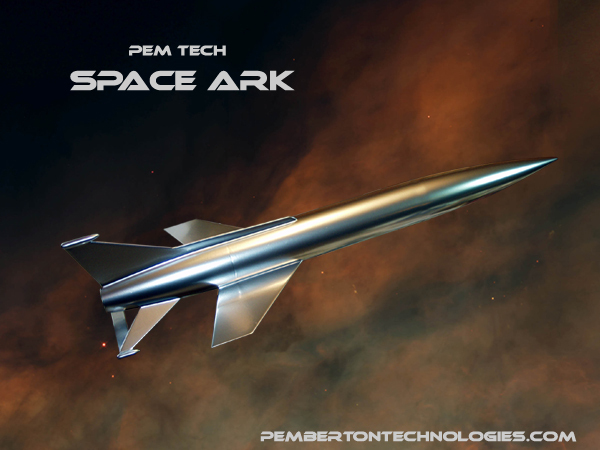 The world is doomed (again) and mankind’s only hope is to load up into their sleek silver Space Ark and blast off into the perceived safety of outer space. Don’t you wish life were so simple again? Kit includes 3″ heavy-duty airframe, 3″ tail cone & nose cone, 38mm motor mount, Heavy Duty chute, laser cut 1/8″ TTW ply fins & wings, 9/16″ tubular nylon shock cord, heavy-duty ply centering ring, motor retainer, 1/4″ launch lug, nose ballast, dowel for those retro fin-tip pods, balsa stock, and our infamous Destruction Manual.